NEW DAY OF THE WEEK! See below for details. Laurie Barnett returned to NTT DATA Services, Inc. last year as a part time Technical Training Specialist, where she develops leadership development training and manages relevant parts of their LMS. She also began taking on independent “gigs” to develop eLearning for her own clients as well as exploring a new career: semi-retirement! Laurie created the Career Development SIG almost 5 years ago. She has a passion for helping others move ahead in their careers. You are welcome to arrive early to network and get settled prior to the start of the meeting. 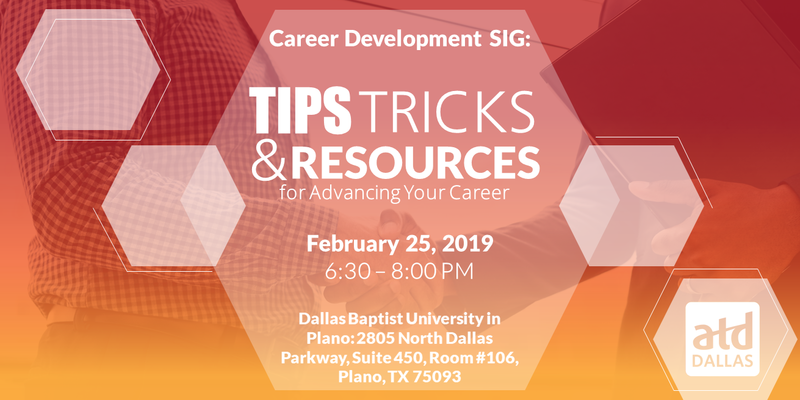 All members of ATD Dallas are welcome to attend any SIG any time at no charge. Non-members are welcome to join us for up to 2 complimentary sessions. After that, to provide ongoing chapter support to the SIG, you will need to join ATD Dallas by paying annual dues of $115.